Tort reform advocates take varying dispositions regarding whether or not comparative fault tort reform has sufficiently compromised the ethical practices of sports industry practitioners. It follows that two of the best place to look for evidence supporting or refuting such claims is in the laws that govern sports and the sports cases that have been brought before the courts regarding the rights of individuals within the communities in which those individuals exist. 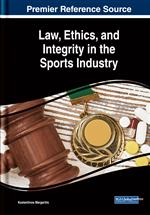 Consequently, the aim of this chapter is to provide an overview of the role of comparative fault tort reform in sports cases. Examination appears regarding how that role has factored into meeting societal demand calling for a re-definition of fairness, as well as changes in the ethical codes of sports practitioner acumen. The law is a codified approach to human interactions. As such, the role of the law, at least in part, is to maintain the delicate balance between individual rights and community interests. Historically, until the mid-1980s, community interests were weighted more heavily, and perceived to be more important than individual rights. This was manifested in a variety of ways, notable among which was the establishment of, and adherence to the contributory negligence rule. Notably, contributory negligence summarily precluded plaintiffs from any and all recovery, if it could be demonstrated that they, the plaintiffs, contributed to their own injury in any way (Keeton, Dobbs, Keeton, & Own, 1984; Sells, 1994). To properly understand how the contributory negligence rule and its preclusion of plaintiff recovery facilitates a balance tipped in the favor of community interests over individual rights, one would do well to consider two associated notions. First, when accidents happen, how often are people quick to attempt to appear innocent? Often, this appears as one party emphasizing the blame of others as a means to veiling, or at the least making it difficult to recognize their own fault. Also, secondly, when people are honest with themselves, how often do accidents happen that are only the fault of one party?